When the Maine Military Authority completes its Massachusetts Bay Transit Authority bus renovation project in a few weeks, it may have to lay off 53 employees if more work is not found. 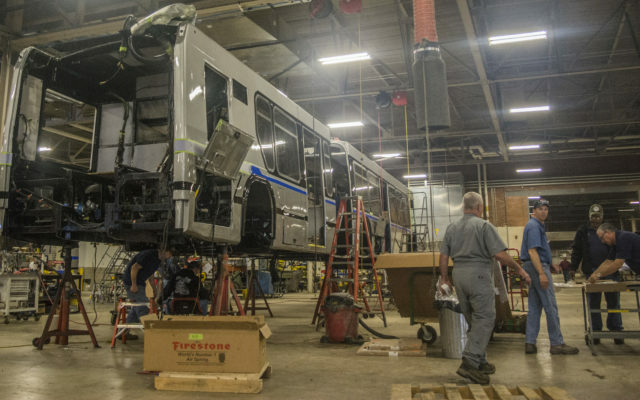 LIMESTONE, Maine — When the Maine Military Authority completes its Massachusetts Bay Transit Authority bus renovation project in a few weeks, it may have to lay off 53 employees if more work is not found. Tim McCabe, head of business development with Loring Industries, confirmed on Friday that while the MMA project is “coming to a close in the next month or two,” he is currently in the process of hiring some of the MMA employees before the project’s end to assist in some of Loring Industries’ upcoming projects. Currently, Loring Industries is working on buses for Motor Coach Industries and is in the process of finalizing other contracts. McCabe said that “more business is coming down the road,” but that he can’t go into detail until everything is official. MMA Executive Director Tim Corbett said on Tuesday afternoon that the 53 workers would have to be laid off if other projects are not contracted by the time the MBTA project is finished. For the time being, Corbett said the only thing they can do right now is follow through with their current project and hope to see additional work in the future. McCabe of Loring Industries said many of the current MMA employees are “very talented” and he’d like to hire them. Loring Development Authority President and CEO Carl Flora said on Thursday that he has “indirectly” heard about MMA letting go of employees at the end of the MBTA project, and that he is aware that officials have recently notified their employees about the situation. He said Loring Industries is close to finalizing an additional contract that will “hopefully increase the volume of work,” for both Loring Industries and MMA employees. “We’re just plugging along and waiting for some good things to happen,” Corbett said.